A delicious, vegan spinach pesto is perfect as a spread for sandwiches or wraps, pasta sauce or a dip for raw veggies or crackers. All you need to make it is olive oil, basil, spinach, hazelnuts, garlic and sea salt. It can also be made with walnuts, almonds or pine nuts as an alternative to hazelnuts. 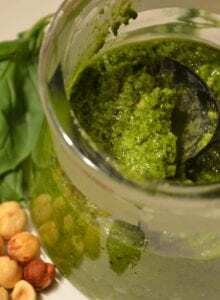 Vegan pesto is actually very easy to make. The only thing you need to replace from traditional pesto is parmesan cheese, which you’ll find listed as an ingredient in more store-bought pestos. 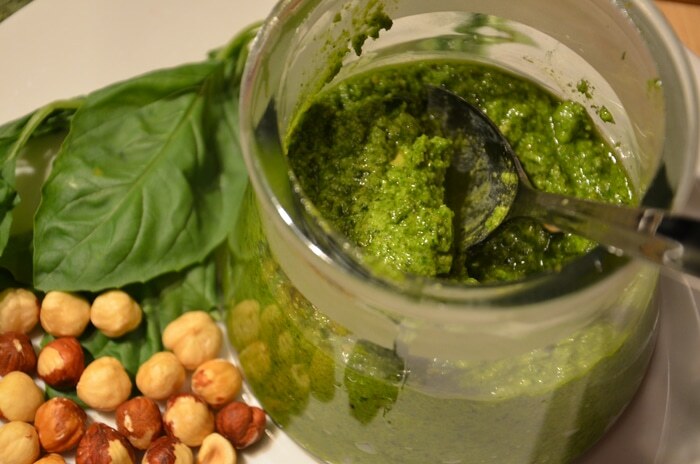 This vegan spinach pesto recipe uses hazelnuts in place of pine nuts and spinach to replace some of the basil. It’s still got basil in there though because you need that amazing basil flavour for a good pesto. You can use hazelnuts, pine nuts, walnuts, pecans, cashews or almonds for the nut. Even sunflower seeds would be good if you want to make it nut-free. You can try my kale walnut pesto to give another greens and nut combo a go. I’ve got a hemp seed pesto too if you’re looking for another alternative to nuts. To make this pesto, all you need to do is blend everything up. You want to leave it with some texture so don’t over blend. I find pulsing it works best. If you don’t have the best blender or food processor, I’d recommend adding the hazelnuts first and breaking them down a bit before adding the rest of the ingredients. Serve this pesto over zucchini noodles, pasta, spaghetti squash, roasted veggies, soups, baked potato, avocado toast, pizza, tofu scramble, in wraps and sandwiches or as a dip for raw veggies. A delicious, vegan pesto perfect as a spread for sandwiches or wraps, pasta sauce or a dip for raw veggies or crackers. Add all ingredients to blender or food proccessor, except for the extra 2 tablespoons of olive oil. Blend on high until smooth, stopping to scrape down the sides. Continue to blend and slowly pour in extra olive oil until you reach desired consistency. Add the sea salt to taste.